With the end of steam services through Amersham by London Transport in 1961 and the end of main line services from Maryelebone north of Aylesbury in the mid 1960s, the type of trains to be seen at Amersham have been dominated by the A60 / 62 rolling stock and from 2010 onwards the S stock of London Transport along with the diesel multiple units of British Rail / Chiltern Railways. However, some unusual sightings have been seen. When engineering works are taking place or delivery of new rolling stock is happening, then some different types of trains can be spotted. I am grateful to Trevor Rolfe for supplying the below pictures. A class 66 at the head of an engineers train by Hervines Wood. Although this track is not electrified, it is still the responsibility of London Underground. Their responsibility ends at Mantles Wood Junction just north of this location. 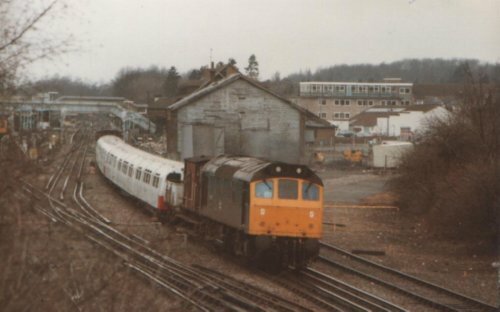 A class 25 delivers tube stock in the 1980s. 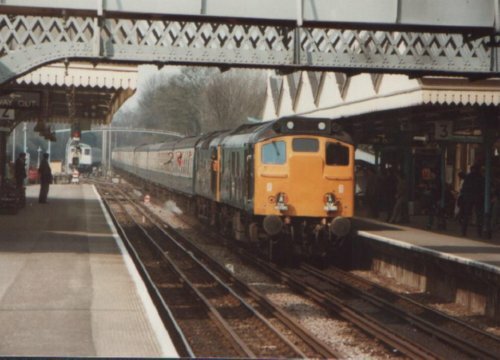 to see how the surrounds of Amersham station have changed. A class 90 is hauled north through Amersham.